Weather permitting, Hartpury College return to National League 1 action at the weekend when we travel to Fylde, in storm-hit Lancashire. Our hosts, who will forever be associated with former England captain and current RFU Chairman Bill Beaumont – a ‘one club’ man throughout his illustrious playing career – are one of the great names of club rugby in the north of England and it will be a pleasure to visit the well-appointed Woodlands Memorial Ground for Saturday’s encounter. Whether it will be as enjoyable on the pitch will depend, in large part, on how the players respond to the disappointment of a first home defeat of the season, sustained when Plymouth Albion were our visitors in the last match of 2015. 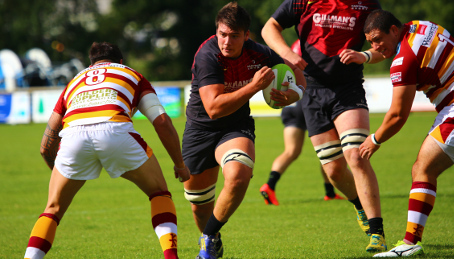 Certainly, the coaches would be happy to see a performance approaching the levels attained in the corresponding fixture last season when, inspired by a Dan Thomas hat-trick, Hartpury stormed to a 35-12 victory in what was arguably their stand-out performance of the 2014-15 campaign. There will be no Dan Thomas this weekend (nor Protheroe, Reynolds, Jackson, Carter, Bartle, Batley or Ludlow – all of whom played that day), but the bulk of the side will be similar to that which was so impressive in victory at Richmond, our most recent away fixture. Fylde’s visit to the College back in September will bear little relevance tomorrow. Arriving late at the ground on a warm and sunny day, Fylde lost a man to red card within the first half hour and were barely in the game as Hartpury cantered to a 39-12 win, collecting six tries along the way, with Jake Polledri (pictured) producing a man-of-the-match performance in only his second league game for the College. Despite a first half to the season which can only be described as inconsistent (six wins, seven defeats and one draw so far), Fylde are still capable of competing with any team in this league, as good results against the likes of Rosslyn Park and Blackheath have shown. The Lancastrians are known for playing an expansive brand of rugby and their back three of Jordan Dorrington, plus wingers Ollie Brennand and Anthony Bingham, continues to be a major source of points. Provided that the pitch is able to shrug off the worst of the recent deluge, there could be a treat in store for any Hartpury supporters planning to brave the post-bank holiday M6. All of the three leading teams are on the road this week. In addition to ourselves, Richmond also head north, to Ionians, while Blackheath come to the Shire to take on the increasingly endangered Cinderford. Plymouth’s recent good run of results will be fully tested when they visit a mud-free Rosslyn Park and Esher would expect to maintain their challenge at the top as they host strugglers Wharfedale. Sitting just above the relegation places, Blaydon will hope that home advantage carries the day against Ampthill. Henley, who potentially stopped the rot with a win over Cinderford last time out, have another home fixture to look forward to, but might find the division’s current ‘form team’, Darlington Mowden Park (six wins out of six), to be a bit too much of a handful. The remaining game is an all-Midlands affair as Loughborough visit Coventry. Finally, a Happy New Year from everyone at Hartpury College RFC! If we don’t see you in Lancashire, our next home game is on Saturday 9th January, versus Coventry (2.30pm).